In the sprawling spheres far below the boundless seas of the planet, the earthmen had established an incredible civilization. But now, a series of seemingly trivial accidents threatened to obliterate all that the men had created. It was Lucky’s job, as a representative to the powerful Council of Science, to find the evil and root it out. Yet by the time he discovered the insidious force which preyed on the minds of men, the only enemy he could hope to destroy…was firmly lodged within his own head! 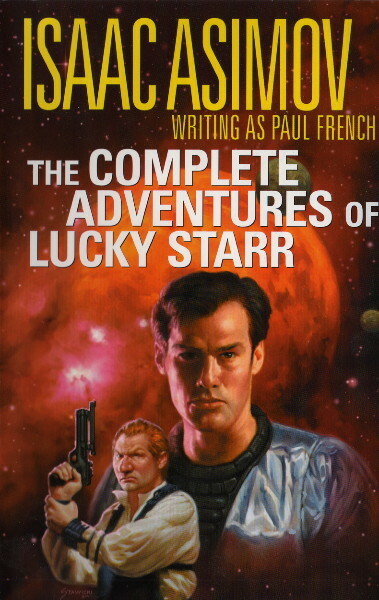 I will not—I cannot—hide the fact that the Lucky Starr books are not among my favorites. I don’t particularly dislike them, mind you, but neither do they rank terribly highly among the books that make Asimov my favorite writer. So here we have the best of the six, I think. As with the other Lucky Starr books, there is little enough to be said about characterization. Indeed, none of the characters here are terribly memorable. It is unfortunate that real life has surpassed Asimov and made of his (stereotypical) watery Venus an impossibility, because that’s the real star of the book and the main item that holds up after forty years. The plot itself is vaguely interesting. I am particularly intrigued by the fact that once again it turns upon mysterious telepathic powers. Asimov would deny the existence of such in his non-fiction— just as he denied the possibility of superlumenal speeds and time-travel— and yet as often happens in his fiction, the plot hinges upon the existence of such. Beyond that, there is little to say about this book. 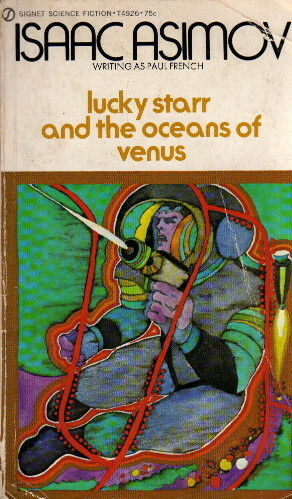 If one is determined to read the Lucky Starr books, one could certainly do much worse than read Oceans of Venus—and yet, if one is determined to read Isaac Asimov, one could certainly do much better, as well.